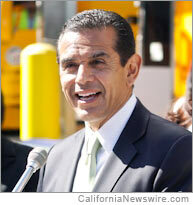 LOS ANGELES, Calif. /California Newswire/ — Mayor Antonio Villaraigosa on Tuesday joined City Council President Eric Garcetti in Council Chambers to declare the City of Los Angeles’ first annual Nonprofit Day. The event was organized by the Mayor’s Office of Strategic Patnerships and featured organizations including Peace Over Violence, City Year, Downtown Women’s Center and Conservation Corps. The Los Angeles region is served by over 30,000 active nonprofit organizations. These nonprofits together comprise a $35.5 billion industry and employ over 245,000 people. Nonprofits fund and provide a wide range of services to the City such as after-school arts programs, gang violence reduction measures, recycling initiatives, and health care and social services to our most vulnerable residents. “Today we’re bringing together leaders from some of Los Angeles’ best run non-profit organizations to share best practices and to identify opportunities to collaborate to better serve our communities. I want to thank them for the work they do every day to help Angelenos who are striving to achieve better lives for themselves and their families,” said City Council President Eric Garcetti. More than one year ago, the Mayor’s Office of Strategic Partnerships (OSP) formed a Nonprofit Advisory Group to advise the Mayor on issues related to nonprofits. It has engaged non-profits to supplement successful City-driven programs such as Summer Night Lights and CicLAvia and streamlined the contracting and grant-making process at the Department of Cultural Affairs to make it easier for nonprofits to work with the City. The Mayor pledged at the Council ceremony today to further improve efficiency for nonprofits working with the City. “We can and must do more to assist nonprofits by removing the bureaucratic hurdles and cutting red tape to allow our non-profits to do what they do best: improve the quality of life for countless Angelenos and keep the spirit of community activism alive,” Mayor Villaraigosa added.